Today’s Gospel and First Reading continue to unfold the ‘Christ Bread of Life’ theme. John’s world is not full of sayings and parables, but of abstract nouns such as light, life, truth and of verbs such as seeing and knowing that also intend to convey a deeper meaning. I always like to see these words as rather like an array of miniature flags whose underlying meanings flutter and unfurl themselves as repetitions throughout this Gospel. Today we are being invited through Jesus and the story of Elijah to receive the ‘Bread of Life’. This invitation is an open one to everyone to believe and receive the grace of renewal and forgiveness. In the second reading, 1Kings we read the story of Elijah who, exhausted and weary, falls asleep under a broom tree uttering, “This is enough O Lord”. 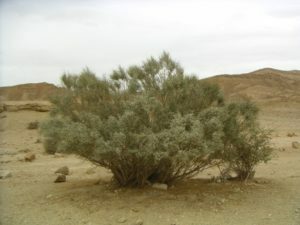 The broom tree, common throughout desert areas in Israel, was used to kindle fires and make charcoal. It is considered to be a tree of renewal and it is clearly a survivor. The seeds are virtually indestructible and can defeat fire and pestilence remarkably well. It is more of a shrub than a tree and yet it was enough to rekindle the energy of Elijah to continue his journey. The visit from the angel and food that was given to Elijah gave him the strength to continue for forty days. What a wonderful image of God’s never ending love and support for us.